As I get older I’ve noticed that the primary thing that keeps my network of peers in music playing, performing and writing is often the rush of collaborating and playing with inspiring groups of friends developed over the years. I’ve also witnessed this with students as young as four years old in my school. Eventually the “me, me, me – I, I, I” attitudes that can happen when studying and practicing an instrument in traditional lessons can leave the experience feeling lonely and unfulfilling to students – even the most accomplished ones. The fire often dies away when they lose a teacher or they go to college and they are literally left alone when it comes to music because they no longer have the parental or teacher support. One of my favorite ways to help students avoid this isolation is to help them connect deeply with other music students over music. Oftentimes these students wouldn’t associate with each other otherwise. Maybe they are different ages, abilities, backgrounds, musical interests, lesson days, etc. We can do this through master classes, regular workshops, recitals and open mics to name a few. But the thing that I’ve seen develop the most intimate and long-lasting connection between students, is composing music for each other. Every kid I’ve ever asked to write a “helper piece” for other students lights up. They often seem very flattered, inspired to think that they will have a role in helping someone else learn to play music better and they will get to write something that someone else performs… Because I always ask the students who the piece was written for to perform the piece for the composer… Either at a recital or bring them together for a one-on-one session where they help each other out. I often won’t even be present for this. But I’ve seen this bond last for years. I’ve also seen students write and play much better after these interactions. How can the younger students help the older students? When the older students sees struggles that the younger student has with the piece, they often see that they wrote something that wasn’t very musical or playable. They see how they could have written something slightly different that would have accomplished the same musical goal but been way more musical and playable. It becomes a collaboration. Both students invest in each other in a very personal way. I always think it’s so cool when the older student will change a passage or a few notes after realizing they could have written it better. They will ask the young student to try it; and they both light up because they both see, hear and feel the effect – and they both contributed to the evolution of the music. For the younger students, I often have them compose a “piece” that one of their peers has to play before they can move on to a new book. 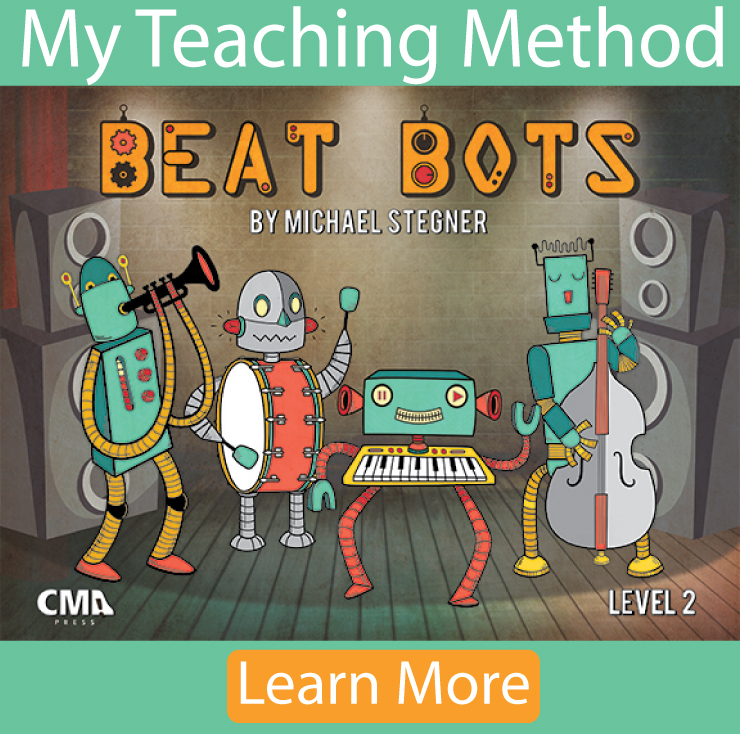 For example, in the back of my books “Musical Monsters” and “Beat Bots”, there are empty staves called “Compose Your Own”. 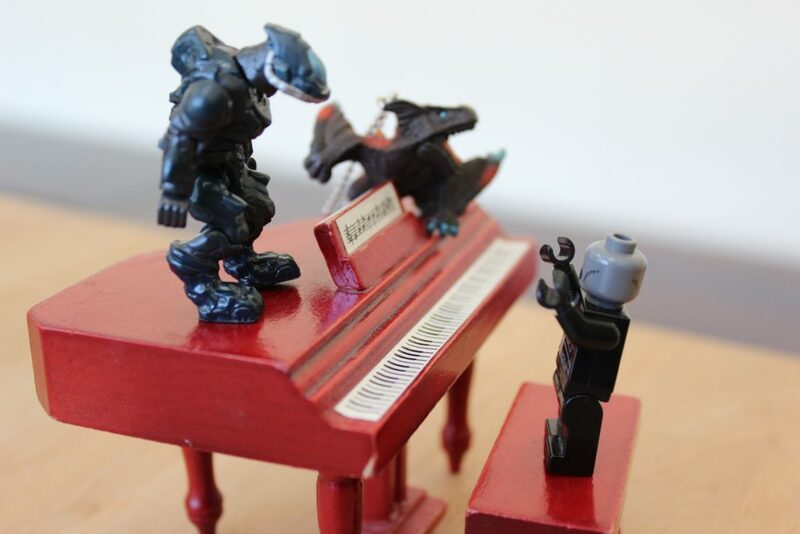 For group lessons, each student has to compose their own short piece. I make enough copies for everyone in the class and they all get to move to the next book when they each play through each others’ pieces. For this to happen the pieces have to be legible and make sense to the kids reading the music… This can take a few passes since having the correct amount of beats in a measure and having the notes on the proper line/space can be a challenge for a 4,5 or 6 year old. Kids become highly motivated to help each other with their pieces. They also become way better readers when deciphering these hand-written compositions. For the older students, I like to form combos or ensembles that meet every couple of weeks. One student is the assigned to be the composer for one of the classes. The class is 90 minutes. The composer is expected to bring in finished charts that are transposed correctly for each player and their instrument. They get 30-45 minutes to rehearse the charts. Then they are recorded. I have a separate group of kids come to set up the recording equipment for two reasons. One, they learn how to make a recording. Two, they get to hear and see the older kids work together so that they have something to aspire in their own playing/writing. It’s essentially run like a professional recording session. The kids reading the charts have one or two takes to record the piece. There isn’t time to rehearse it over and over again. The composers for the week learn about what works and what doesn’t based on what they are hearing. They learn how much is possible to tweak in a short amount of time if they hear something they don’t like. They also learn how to write to the other players’ strengths. The kids who are reading the charts become way better readers since they only get the one session to rehearse. They learn to perform at a higher level when under the pressure of recording. And they learn to manage their rehearsal time well. For all students involved, this builds a community that I’ve seen last groups of students well past high school and college. Music has the power to build community. Especially when the music is provided by members of the community.